Popped into Blackmere antiques emporium on the way back from a table top sale in Tarporly (A very nice little village towards Beeston). Found this card which looks hand printed. 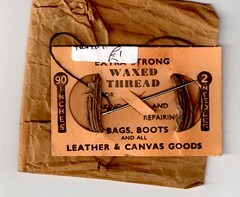 "EXTRA STRONG WAXED THREAD..for MAKING AND REPAIRING BAGS, BOOTS and all LEATHER AND CANVAS GOODS. It reminded me a little of Trevira's blog. The price label is still on because if I fetch it off it will rip the card..
And it cost a pound. It came with the brown paper bag. 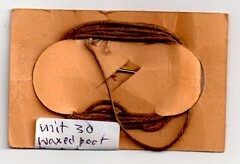 A few simple cuts in the card forms a handy needle and thread holder.